1942. "White-hot steel pours like water from a 35-ton electric furnace at Allegheny Ludlum Steel Corp., Brackenridge, Pa. 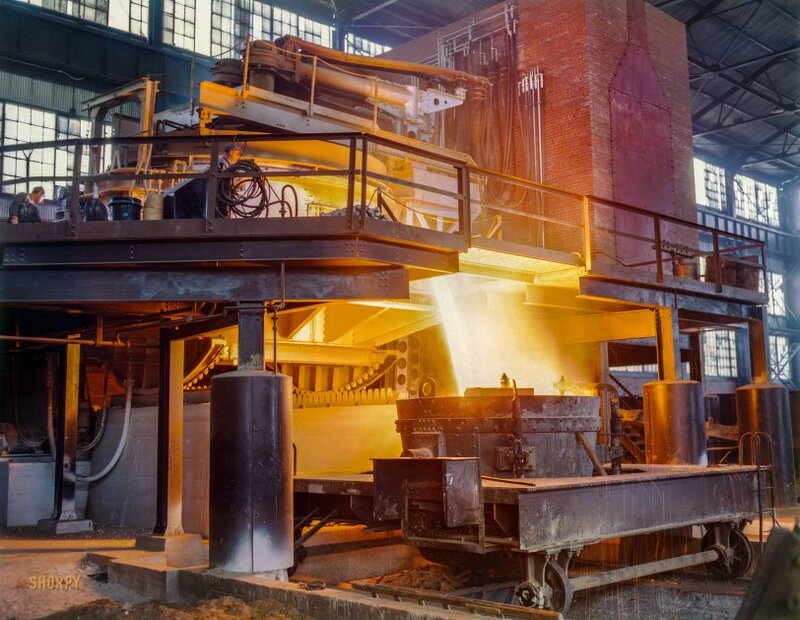 The finest quality steels and alloys are produced in these furnaces, which allow much greater control of temperature than other conversion furnaces. The proportion of electric furnace steel is rising steadily, even though this process is the most expensive. The furnace is tilted for the pouring; the flying sparks indicate the fluidity of the steel." 4x5 Kodachrome transparency by Alfred Palmer for the Office of War Information. View full size. Submitted by Rob Ellie on Thu, 05/31/2018 - 12:15pm. AL had four of these little furnaces. Eventually replaced by two 120 ton units. There is no way to describe the noise generated by an arc furnace burning in on a fresh 60 ton bucket of scrap. If you walked between two of them while this was going on your whole body vibrated. Charging was dangerous too. 60 ton of wet, or worse, icy scrap dropping into 60 ton of hot metal was a thunderous experience. The operators pulpit, the charging crane and the hot metal crane all had roll down blast shields that were used during every charge cycle. The "pours like water" comment is correct. The viscosity of 3000 degree steel is the same as water. When the hot metal crane picked up a full ladle after the furnace tap and the crane siren started screaming, you stayed away, far away. Submitted by salty4568 on Tue, 05/29/2018 - 5:12pm. I operated an electric arc steel furnace making high-strength alloy steel. Interesting job!